The early gospel group, formed in Danville VA, where Russell and Ed had moved to work in Dan River Cotton Mill around 1951, was called The Easter Brothers and the Green Valley Quartet. This group also included several other relatives and Allen Mills (currently of Lost and Found) who played bass. Around 1962, the group was narrowed down to just the three brothers, and Russell’s oldest son, Russell Jr. Easter, joined the group, playing the dobro guitar. He was 12 years old at the time. Ronald Thomas, Russell’s brother-in-law also joined the group, playing the bull fiddle bass. Various musicians came and went through the next several years, but the 3 part harmony of the Easter Brothers remained the same. Russell’s youngest son, Roger began playing drums and occasionally bass for the group. Russell’s daughter, Linda, also performed solo songs on two of the projects in the 1960’s. During this time, two of James’ sons, Jeff and Steve Easter, also joined the group playing various instruments. Jeff Easter also recorded solos on different albums and projects. During the 60’s and 70’s, two of Ed’s sons, Eddie and Bobby, joined the group. Russell’s grandson, Jason, and James’ grandson, Josh also played with the group for a period. The younger generation became known as the Easter Bunnies. As the younger generation grew older, a few of them began playing with other groups such as the Lefevres and the Happy Goodmans. Russell Jr. and Steve Easter became staff musicians at gospel music recording studios. Later several of the “Bunnies” formed their own groups such as Jeff with the Jeff And Sheri Easter group and others pursued other interests. Bobby Easter also formed a group, Calvary Express and began selling buses which has helped keep the Easter Brothers on the road for many years. Steve Easter and Russell Jr. also formed their own groups. As of 2009, the group consists of Russell Sr., James, Ed, Russell Jr. (banjo, dobro, steel guitar), Jared Easter (son of Russell Jr. on the mandolin) and Barbara Easter (wife of Russell Jr.) on the bass. The Easter Brothers collectively have written over 300 songs which include gospel greats such as “They’re Holding Up the Ladder” and “Thank You Lord for Your Blessings on Me,” both of which have won Dove Awards (2002 and 2009). 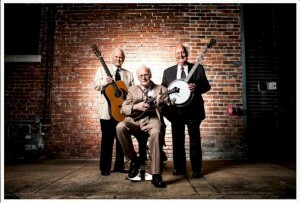 The Easter Brothers’ songs have been recorded by many other groups in the gospel music industry. The artists who have recorded songs written by members of the Easter Brothers include the Primitive Quartet, the Happy Goodmans, the Dixie Melody Boys, the Dixie Echoes, and the LeFevres.